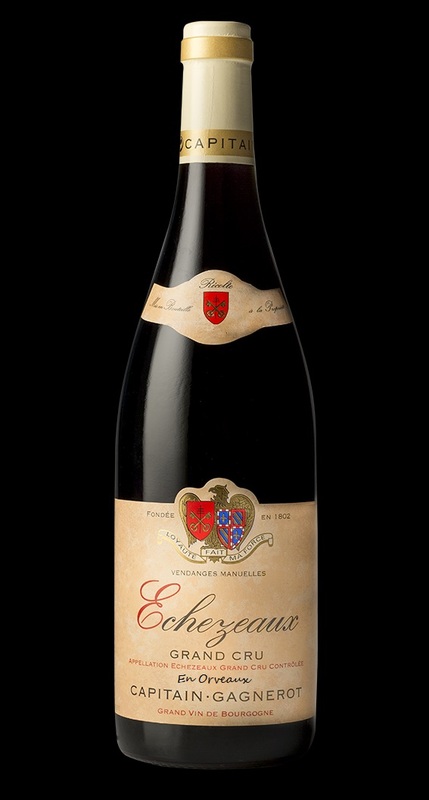 Capitain-Gagnerot Echezeaux Grand Cru En Orveaux is made from 100 percent Pinot Noir. Chalky soil with fossils (entroques) from the Bajocian era mixed with dark red clay and flat stones (laves). Harvested by hand, sorted and destemed. Alcoholic fermentation in open vats, for about 15 days with 2 punch-down a day at the beginning. Maturation in oak barrels (10% new barrels) for 13 months. Color : Brilliant ruby red, almost garnet red. Nose : Opens on blackcurrant and blackberry aromas, lightly spicy with a coffee note. Mouth : Perfectly balanced, round, powerfull and harmonious. Pairs with cepes mushrooms, truffes mushrooms, roasted foie gras. The Domaine Gagnerot was established in 1802. In 1864 Marie, Jean-Baptiste’s unique daughter, marries François Capitain, wine trader, native of Champlitte. Together, Jean-Baptiste and François establish the Domaine Capitain-Gagnerot. After the phylloxera crisis wich ravaged the Burgundian vineyard from the 1870s the the 1880s, Marie then widowed, decides to keep the domaine and to replant it vines. The succession is since made from father to son. After the Second World War, Roger Capitain inherits 3 hectares of vineyards and a wine trade. His two sons, Patrice and Michel, take over the domaine upon his retirement. Today, the domaine comprise 16 hectares of vineyards in full ownership, and it is Pierre-François and Delphine, Patrice’s children, who now oversee its destiny, supported by their spouses. The particularity of Burgundy is to produce on diversified terroirs wines elaborated with a single grape variety, which emphasize the specificity of every appellation : Pinot Noir for red wines, Chardonnay for white wines. Our terroir refers to the specific characteristics of grounds, subsoil, weather conditions and vines, but it is also the result of man’s work and knowhow, refined over a long history. Located at the junction of Côte de Beaune and Côte de Nuits, the highly defined vineyard of Ladoix is ideally situated on the Coteau de Corton, the only hillside in Burgundy to produce both white Grand Crus and red Grand Crus. • Clay and limestone, yielding red wines of great finesse. Our wines are produced in accordance with reasoned culture principles, applying at the same time the principles of integrated farming and as often as the weather conditions allow it, those of biodynamic farming. We work in harmony with the vineyard and its ecosystem, by favoring natural treatment products and by limiting our interventions to the minimum, in order to obtain a healthy harvest. Vineyards are regularly earthed up and ploughed to ensure that the vines draw in depth the typicality and the expression of their terroir. Plowing also avoids rapid erosion of the soil, therefore ensuring optimal growing conditions for the vines. A rigorous selection of plants, a thorough pruning and an early thinning out of leaves allow the control of quality and yield. To always obtain the best of each plot, there only remains to select the most favorable harvest date for an optimal maturity and quality. We believe that great wines are born in the vineyard. Completely hand-harvested, grapes are sorted out and destemmed before being placed in tanks to be vinified. The fermentation of Pinot Noir is naturally made, in open tank, without yeast addition, during 12 to 15 days following the harvest, in a temperature not exceeding 30 degrees Celsius. The wine is punched-down twice a day at the beginning of wine-making. Wines are exclusively matured in oak barrels during 12 to 18 months. After the malolactic fermentation and a light filtration, they are bottled. After racking of the must, our Chardonnay ends its alcoholic fermentation in barrels at a temperature between 20 and 22 degrees Celsius to ensure that it retains all its aromatic freshness. After a minimum 10 month maturing in cask, wines are racked, filtered and bottled. To protect the character of our wine and its terroir, we do not use more than 10% of new wood. We believe that wood is solely a support in making good wine, and a slight touch of it is enough to achieve that goal. Our viticulture and wine-making reflect our will to make genuinely fresh wines, which are the expression of our rich terroir, and of the elegance of the great grape varieties of Burgundy.